Since I went out of my way to highlight the relative shrimpiness of Brett Favre's nephew, Mississippi State freshman Dylan Favre, earlier this week, it's only fitting I return to the Magnolia State to bring you the first look at the largest player in the country. Meet Ole Miss walk-on Terrell Brown, who at 6-foot-11 and 390 pounds, is, according to The Clarion-Ledger, "almost too huge to play football." I was going to make a joke about the guy straining to water Mssr. Brown being the tallest guy in his high school or something, but that's probably too close to the truth to be funny. As for his prospects as a player, well, there's a reason he's walking on. Brown's football experience is "very limited," according to co-offensive coordinator Mike Markuson. That may be something of an overstatement. Brown transferred to Ole Miss from Mississippi Delta Community College, but isn't listed on the 2009 MDCC roster and has no profile on any of the major recruiting sites. 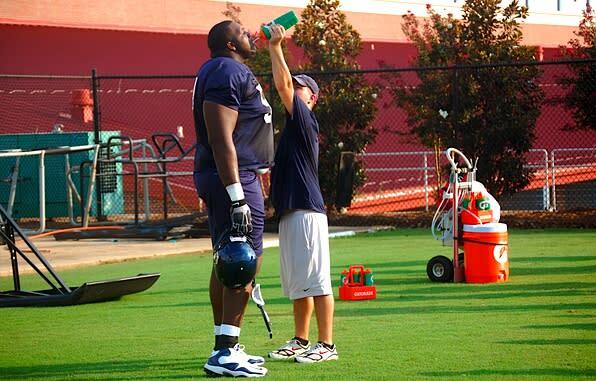 Like more celebrated Rebel predecessor Michael Oher, he seems to be a giant who appeared from nowhere. Photo by Ty G. Allushuski/Oxford Enterprise. Hat tip: Friends of the Program, via Richie.